Em's Knitty Corner: More mitts, hats and scarfs ... and it's finally winter!!! More mitts, hats and scarfs ... and it's finally winter!!! Yes, I kept going on the mitts and scarfs and hats, and the weather finally turned! I'm so happy! It's been freezing for a couple of nights and temperatures just above freezing during daytime, so it's just ok for me! Unfortunately the temperatures will go up again by the end of the week so defenately no white Christmass. That's to bad, but I'm used to it. 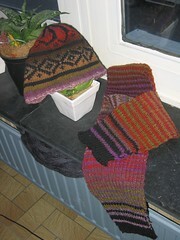 Now I've been knitting quite a bit of recent and I'm also planning on a lot more knits. I made the decission of not doing many Christmas knits at all, and that was a big relief! My family is not appreciative about handknits and I wasn't going to stress over it anymore. Now I had the luck of pulling the name (we pull names for Christmas so we can spend more on one package instead of buying a ton of little ones) of my aunt, about the only one who told me many times this year how much she appreciated the gift I knitted her last year : felted booties for in the evening when she watching tv. So the decission was easily made to knit her a new pair. We only did the pulling of the names on Saturday so I still have to get started on them, but I know they are a quick knit so it's no problem at all! Now of course my sister has been nagging me for knitted stuff as well. Just when I decided to put a hold ot knitting for family. We'll see where I get. 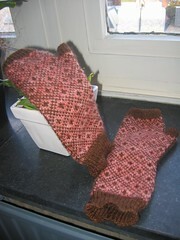 I am however knitting gifts for the 2 ladies at my LYS. I love them both - they are more friends then anything - and I couldn't help but wanting to knit them something. I already finished the fingerless gloves for one of them (pictures to follow), and am working on the bed socks for the other lady. They should be finished by Thursday as I'm going to visit them then. I had a lot less knitting time today then I anticipated but we'll try! Now before I bore the few readers I have left (I wonder if there is anyone left out there! :D) a few nice pictures of finished objects!! Started/Finished : don't know, but it was less then a week to make them! As for the scarf, I used a bit of the Cascade to make it match the hat. It was such a fun knit! I cast on 34 stitches, so the scarf is rather short. It's ok to wear under my ski-coats, but I am planning on knitting a longer one. I'm in love with this shade of Kureyon but I think I will just knit straight on for the next scarf (3 balls I'm thinking, maybe 4), or I might use one of the the patterns in the Garter Belt Newsletter (It's a PDF). (I'm a bit addicted to the hats by Wendy too ... keep knitting *grin*). 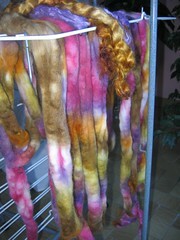 I've also been dyeing yarn, and spinning (no pictures of the latter). This is Merino, and on top is mohair and fake cashmere. I dyed another batch of German wool, but I'm not sure about those colours. I bit to much yellow/gold for my taste. I'll post a picture soon, I might be willing to swap it for some other fiber! By the way, talking about Eunny, I'm so hoping to see a few more designs of her published soon!!! I love her stuff! Have you seen the cardigan she's working on? One of my Newyears resolutions will be posting more online, and getting back in touch with all my snail mail friends. I miss writing and I should get my time better organized now that I'm on a good shedule with work. I have 2 more full days of work left this week and then it's 2 weeks off. Well, except for 1 day, to do my boss a favor as they didn't make enough money the past year (not my fault as I started working there in September and since October things are super better) and they can't afford to close for the holidays. Luckily I can safe my holidays from this year and take them with me to next year (officially not really possible) as I won't have that many days off then. I'm already planning a few more posts, with or without pictures, so please do keep reading! I also want to update my blog more often and over the holidays I hope to figure out how to make it a little more personal (might motivate me to post). I'll leave you with a picture of my dog, who's been having some health problems, but I'm not going to bother you with those! I loved seeing all your knitting projects and your hand-dyed merino. I would love to see your spinning. I hope your dog is okay. 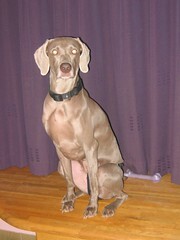 I love my pets and I know how special they are, so you have my well wishes for his better health. That hat you are showing is also on my to-do-list. Amazing. I keep checking back. Another fav in my bloglines. scroll down to page three and you'll notice the men's ear warmer pattern. LOve the colors on the hat and scarf! Beautiful! Have you gotten winter yet?